"Extremely satisfied" with his maiden Test double hundred, India skipper Virat Kohli says the feat has helped him wipe off the memories of his disappointing debut tour to the Caribbean in 2011 when he had struggled with the bat. 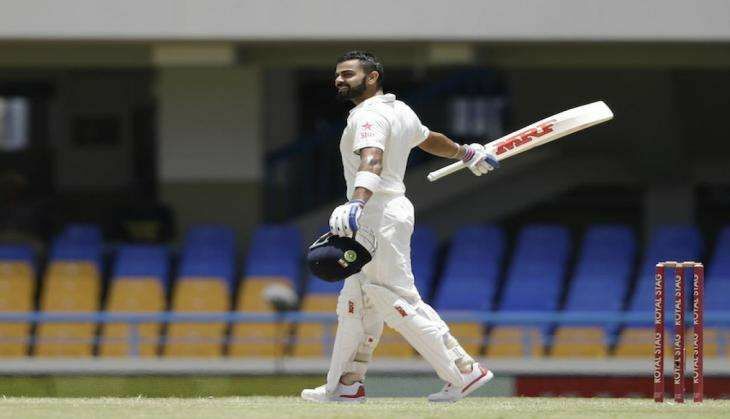 Kohli returned to the Caribbean after five years and got down to business, scoring his maiden 200 in the very first innings of the opening Test match against the West Indies in North Sound. "Yes, it is a very good feeling. I made my debut here and it wasn't a memorable series for me. Coming back here and getting a double hundred gives me a lot of satisfaction purely because of the fact that I have missed a couple of big scores in the past," said Kohli, who had averaged just over 15 in the 2011 trip to the Caribbean. The 27-year-old became the first Indian captain to get a double hundred in Tests overseas and Kohli said it was a very good feeling. After his maiden double ton, India's Test captain @imVkohli has a selfie message. "I know I have the ability to get big hundreds. This is my first double hundred in first-class matches in general, so this is something I always wanted to do and I am feeling really grateful that I was able to cross the mark. "It is just a very good feeling. Test cricket is the most important format as far as I am concerned and the whole of team is concerned, so when you do well in Test cricket, it gives you the job satisfaction like nothing else. I am really happy for this moment," he told BCCI.TV. Kohli said playing with just five specialist batsmen put added responsibility on him and he wanted to lead by example. "It is very important to understand the responsibility in front of you when you go in with a combination. Playing five batsmen is a bit of an added pressure on the batsman but that is what we want to take up as a challenge. The batsmen decided to take up the responsibility. As captain, I would never ask the players to do what I cannot do myself first and I have always believed in that," he said. "In this innings, the West Indies bowlers bowled well initially with the new ball and we were not getting many runs. I had decided in the change room that I am going to go out there, be positive and show intent and the runs started flowing. I knew if I stay long enough at the crease, I will get the runs I required and the team requires at the same time, and ended up scoring at a very good rate." The right-handed batsman said it was a very good batting effort by his team. "We had very important contributions by Shikhar Dhawan (84); understanding the responsibility. Ravichandran Ashwin batted beautifully and got a hundred as well. Wriddhiman Saha (40) contributed well and Amit Mishra made 60 odd (53) in the end. All in all, it was a very good batting effort by everyone and something that we can be proud of. It is a bit of an added pressure (on the batsmen) but something that is what you want at this level of cricket," said Kohli. Aware of people's expectations from him, Kohli said he feels at peace when he is batting in the middle alone. "I think what a lot of people don't understand is that there is more pressure when you're not batting. When you are in the change room, you're interacting with people, you get to know what people are saying and what people close to you expect from you. I think those are the things that give pressure. When I go out to bat, I am all by myself and my batting partner. "People don't understand that I am actually at a lot of peace when I am batting alone out there because I don't have to interact with too many people and don't have to listen to their expectations or know what they require of me. I can literally reflect on myself, understand what my thoughts and mood are and then work on those things. That is why I always prefer being out there in the middle than getting to know these things from people," he revealed. On the adjustments he had to make on this track, Kohli said: "I think the shot selection is very important on this kind of wicket. The wicket has enough pace as you saw with the two fast bowlers in the end as well. You need to bowl good areas but at the same time, as a batsman you need to select your shots and that is what I focused on as well when I went out to bat. "I backed myself to be positive, backed myself to score quickly because I knew if we had to bowl the opposition out, we need enough time for the bowlers; to be fresh again and also have breaks in between. This was one innings that came together very nicely." READ NEXT >> An Audi car that can be driven by merely moving your head? Believe it!